How do I start adding projects? Can I add multiple images? Why is there no image showing for a project on my profile? Can i rearrange the projects on my profile? Can I rearrange the images and videos in a project? How do I change the title of an image or video I've uploaded? How do I change one of my projects? How do I link people to my uploaded project? Can I link companies to my uploaded project? Start adding projects to your profile by going to the My projects page. From here you can organise your projects, uploading your images and videos and connecting your projects to those that Madeit. Click Create a new project to get started. Fill in the details of the project including its title, the end client, who you were working for, a description of the project as a whole, and add tags it to make it easy for others to find. Next you can connect the project to the other people that you collaborated with. Just add a name or name and email and the system will search for you. Select the person to add them to your project. That person will also be asked if they'd like to feature the project on their own profile. Now you are ready to start adding your images and videos! When you add an image it needs to be part of a project. To find out how to set up a project click here. Once your project is ready, click browse and select one or more images from your computer. Click the Upload image(s) button and your upload will begin. Your image or images will appear below. Your images will automatically be given the filename that they were saved with, but you can change these. 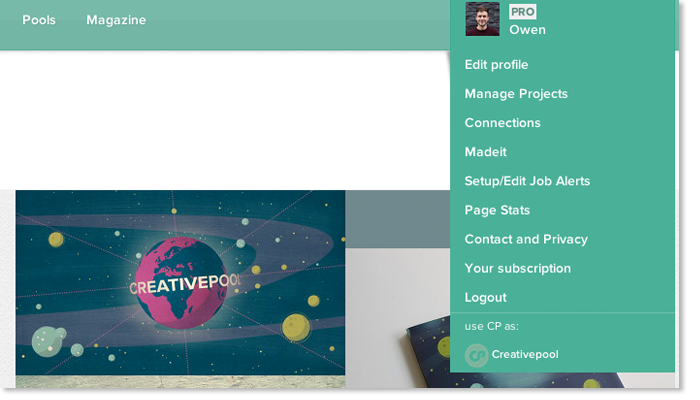 Find out how to organise your profile and projects. You can upload JPEG, GIF, PNG, and PDF file types. Try to keep the size under 2MB for fast uploading. To add more than one image click browse and select multiple images using Ctrl or cmd and selecting. Click OK, and when you click the Upload image(s) button you will see multiple images appear below. Uploading a video is the same as uploading an image. You must first set up a project that the video will appear in. Find out how to set up projects. Make sure that the Upload selection box is ticked. Then click browse to find your video file. Add a title for your video and click the Upload video button. You can upload MOV, AVI, MP4, MPG and FLV file formats. Try to keep the file below 25MB to avoid upload problems. 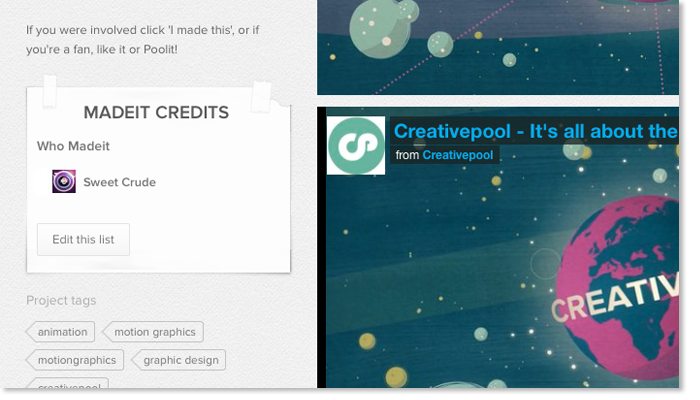 If you already have videos uploaded to the web you can easily add these to your projects. You can embed YouTube and Vimeo videos. When you are in a project, click 'Link to' under Videos and then just drop in the video web address and add a title. Click the 'Upload video' button and your video will be added to the project. Are you unable to see an image for a project, but when you hover over the link it shows the link title? To make sure this project looks perfect on your main profile page, we advise adding an image to the project as the first item in your project. It's really important to have your profile looking it's best and we've made it incredibly easy to organise and arrange your projects. When you have a number of projects uploaded you can drag and drop into any order on the My projects page. 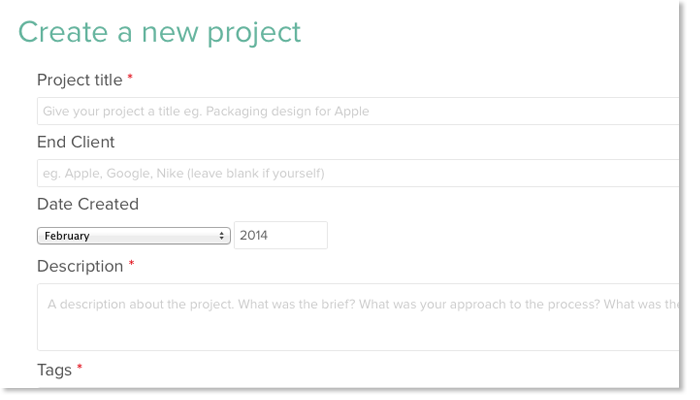 On this page you can also rename projects just by clicking on the name, retyping and pressing Enter. In the My projects section you can easily rearrange and organise your uploaded images and videos. Click 'Edit' on any project to change details or uploads in that project. At the bottom of the page there will be a summary of your uploads. You can easily change the order of these images and videos by dragging and dropping. You can also move images and videos between projects by selecting them and then choosing the project you'd like them to appear in from the drop-down. When you upload an image it will automatically be given the file name that it was saved as. To change this is easy. Go to My projects and go to 'Edit' where the item was uploaded. At the bottom of the page will be all of the items that you added. To change the names of these images and videos click on the name of each image and simply type in your chosen text. When you click away this will be saved. It's easy to make changes to your projects! Just hover over your name at the top right of the screen and click Manage Projects. Go to the project you'd like to change and click Edit. 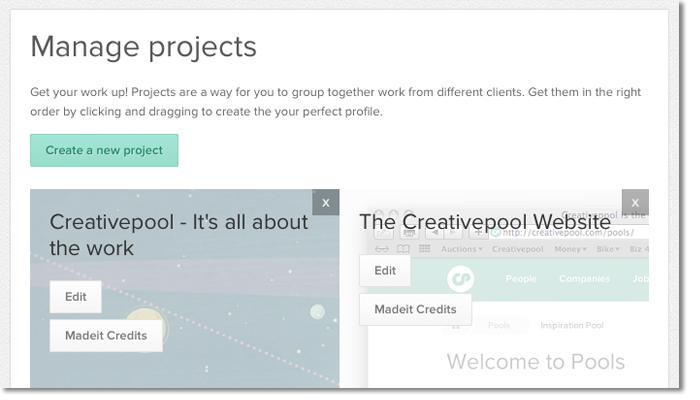 Creativepool's Madeit feature allows you to connect to people and companies through the projects you've worked on together. 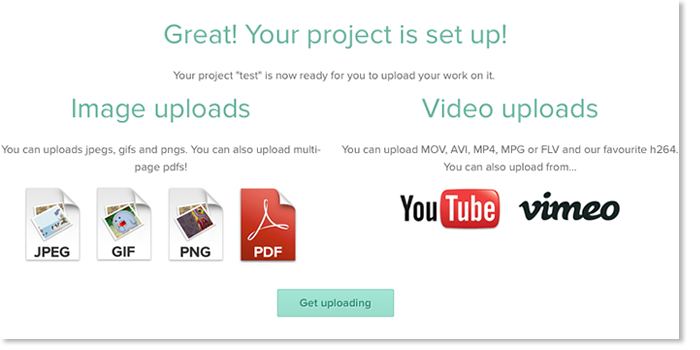 When you upload a project you'll be taken through the process automatically. You can see the process here. 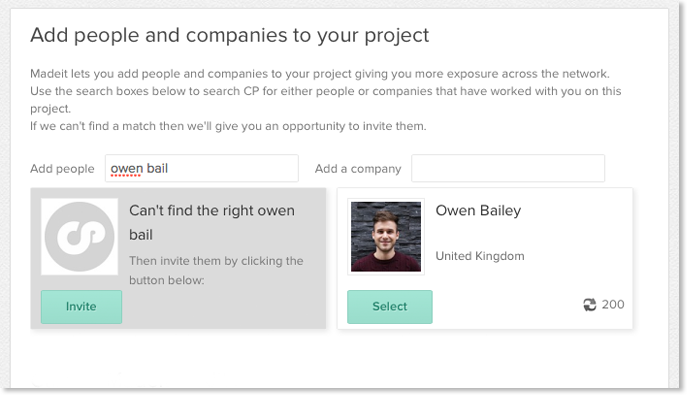 If you've already uploaded projects and you'd like to add people or companies to them, just visit each project and click 'Edit this list'. 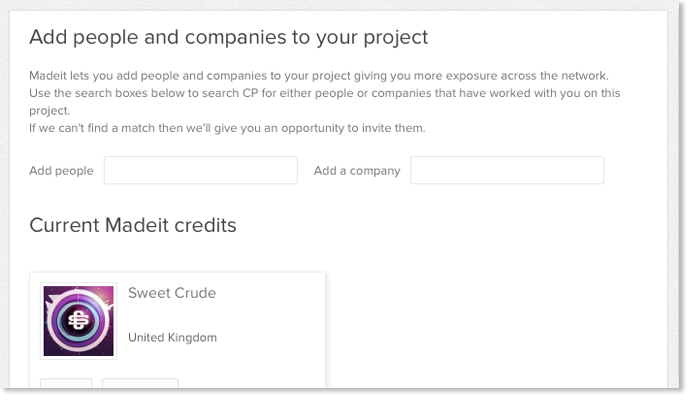 You can add people or companies to your project by typing their name. Search results will automatically begin to appear as you type. If you don't see the person or company you're after you can click 'invite' and send an invitation out directly from the site. You can add companies in exactly the same way was as individuals. Here's how.